Mineralocorticoids - steroid hormones secreted by the adrenal cortex that stimulate the reabsorption of sodium and the excretion of potassium in the distal tubules of the kidneys; aldosterone is the major mineralocorticoid in humans. For the proper understanding of the principles on which the diagnostic tests of adrenocortical function are based, it is desirable to understand the histology, biochemistry, physiology and pathology of the pituitary and adrenal glands and their functional interrelationships. Review of these topics prior to study of this chapter is recommended. Figure 3 in this chapter shows the interrelationship of the hypothalamus, pituitary and adrenal gland. 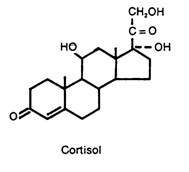 It is apparent that cortisol is the major steroid. The first diagnostic effort should establish the presence or absence of normal cortisol production by measuring the serum cortisol levels and urinary free cortisol. Serum Cortisol: Cortisol is produced in the zona fasciculata of the adrenal cortex from cholesterol through a series of enzymatic reactions, the rates of which are controlled by ACTH. 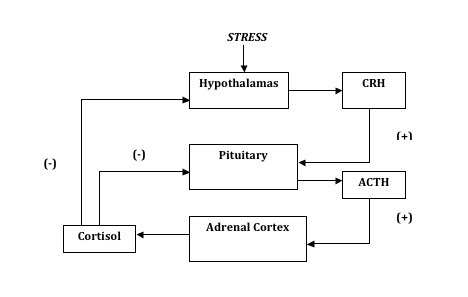 Only cortisol (and none of its precursors) when secreted into the bloodstream effects negative feedback on the hypothalamus and on ACTH release by the pituitary. ACTH release is further controlled by CRH (corticotrophin releasing hormone) from the hypothalamus and is subject to a diurnal rhythm related to the sleep-wake cycle and the influence of stress. 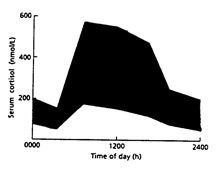 ACTH release during a 24 hour cycle occurs in several bursts. The largest one is in the morning hours between 5 and 8 a.m. but others during the day appear related to food ingestion. Since the half-life of ACTH in circulation is only about 5 minutes while that of cortisol is about 65 minutes, the cortisol burst responses in the blood are less pronounced than those of ACTH and also lag behind. Cortisol serum levels are lowest from midnight to 4 a.m. and highest from 6 to 9 a.m. (Figure 2). However, for practical reasons, sampling of blood for studying the diurnal rhythm is done at 8 a.m. and 4 p.m., the evening values normally being about half of the morning values. The total cortisol circulating in plasma is in mass equilibrium between protein-bound and free fractions such that 80% is bound firmly to transcortin (CBG, cortisol binding-globulin, an α1-globulin produced by the liver) and 10% is weakly bound to albumin. The remaining 10% is free. Only the free cortisol is metabolically active, and its level determines urinary excretion. The level of circulating transcortin rises in pregnancy and with estrogen therapy, resulting in an elevation of total blood cortisol; the free remains normal, since it is regulated by feedback mechanism. Transcortin normally is nearly saturated with bound cortisol. Thus, as in hypercortisolism, the binding capacity of CBG is exceeded when cortisol levels rise beyond 20 to 25 μg/dL, resulting in a steep rise in free cortisol. The result is a sharp increase in urinary excretion of free cortisol while the rise in plasma cortisol is less dramatic. Methodology: Blood cortisol is best determined by immunoassays. Although a major improvement over pre¬vious techniques, these methods are not entirely specific since corticosterone, cortisone, 11-desoxycortisol, progesterone, and some synthetic steroids also bind in varying degrees to antibodies used in the assays. In conditions where these compounds may be elevated, this cross reactivity should be kept in mind. Sample handling: Cortisol is a fairly stable substance, and clotted blood samples suffice when sent to the laboratory without delay. Increased values and particularly abolishment of diurnal variation are seen in Cushing’s syndrome. Increased values are also seen in pregnancy and estrogen treatment (contraception) due to increase of CBG without functional hypercortisolism (see above), in alcoholism, in stress, and in starvation. Low values are seen in Addison’s disease, chronic illnesses, and in adrenogenital syndrome. It would be desirable to measure the free cortisol in blood as this fraction constitutes the metabolically active form. However, this is technically not easily achieved. As the urinary excretion of cortisol parallels the level of free plasma cortisol, the former can be used as an indirect measure of the latter. As stated previously, a rise in plasma cortisol beyond about 20 μg/dL, the approximate saturation level of transcortin, leads to a sharp increase of free cortisol and urinary cortisol excretion. For instance, a rise of plasma cortisol from 20 to 25 μg/dL may be accompanied by a doubling of urinary free cortisol, or a rise from 20 to 40 μg/dL in plasma may be accompanied by a five-fold rise in the urine. Thus, with urinary free cortisol determinations it is possible to differentiate more easily between normal and abnormally increased cortisol production as there is little overlap between the normal range and the range of values found in Cushing’s syndrome. In the diagnosis of Cushing’s syndrome, the sensitivity of this test is 96.9% and the specificity is 94.3%. Values seen in Cushing’s syndrome are almost always higher than 120 μg/day. In fact, this test is most sensitive in the detection of hypercortisolism. Furthermore, in conditions of increased turnover of corticosteroids, as in obesity, or increases in transcortin, as in pregnancy, where the level of circulating free cortisol is not increased, the urinary free cortisol values remain normal. This test is not useful in the assessment of Addison’s disease, since a great deal of overlap of values occurs in the lower range of normal. Mild increases have occasionally been reported in starvation or in the use of topical steroids. The measurement of plasma ACTH would be a most useful diagnostic test in the evaluation of hyper- and hypocortisolism. Unfortunately, there are still technical and practical limitations which have prevented this test from becoming widely applied. ACTH is very unstable in blood samples because of its destruction by proteolytic enzymes within a few minutes; specimens should be centrifuged at 4°C and immediately frozen. It is adsorbed onto glass and thus glass collection tubes should be avoided. The test, however, can have considerable diagnostic value if test conditions are rigidly controlled (addition of proteolysis inhibitors, immediate icing of blood samples, immediate handling by the laboratory during standard sampling times between 8 and 10 a.m.). Under these conditions normal subjects show serum concentrations ranging 50 to 100 pg/mL if a method is used that detects intact molecules and some fragments. The main application of this method is for detection of ectopic tumors. Values are 10-50 pg/mL if the method detects only intact ACTH. This method is preferred to evaluate pituitary ACTH secretion. To differentiate primary from secondary adrenal insufficiency: in the primary form, because of the absence of the negative feedback on the pituitary by cortisol, ACTH secretion is not inhibited and levels are usually greater than 200 pg/mL. In the secondary form, due to pituitary insufficiency, levels are below 75 pg/mL. To determine the cause of Cushing’s syndrome: in basophilic adenoma and ectopic ACTH production (as by oat cell carcinoma of the lung) levels may be higher than 200 pg/mL. In patients with adrenal adenomas or carcinomas that produce cortisol in excess, ACTH levels are low. 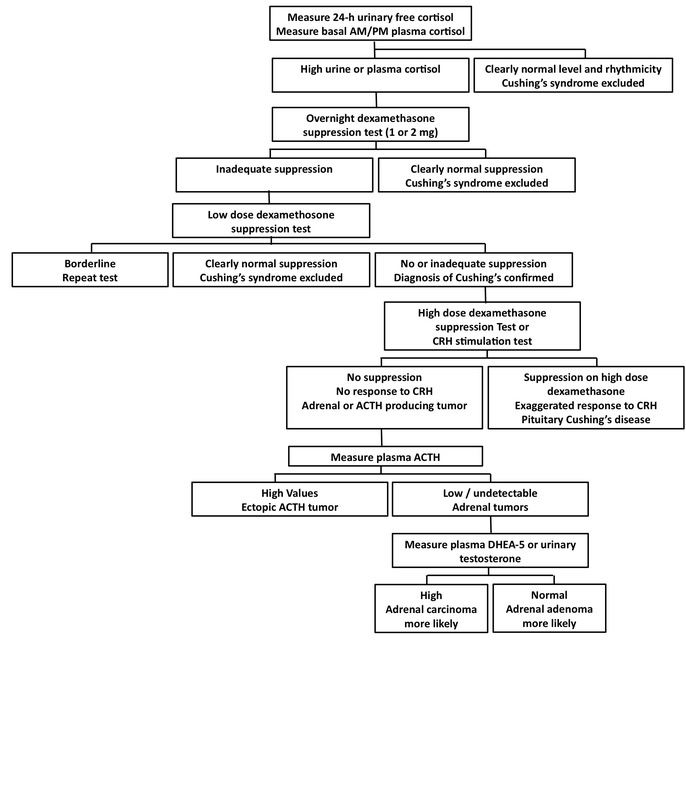 In the demonstration of ectopic ACTH production by rapidly growing malignancies before the full-blown Cushing’s syndrome develops: values may be > 300 pg/mL. In the diagnosis of congenital adrenal hyperplasia: these patients lack cortisol and, therefore, have high ACTH levels. ACTH levels are expected to be in the normal range with adequate cortisol treatment. This test is used in the differential diagnosis of Cushing’s syndrome. Its purpose is to determine whether the hypercortisolism that causes this syndrome is pituitary-dependent or not. 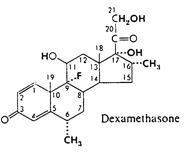 Dexamethasone is a synthetic fluorine-containing cortisol analogue which has 10 to 20 times the metabolic potency of cortisol, including its negative feedback action on the pituitary. When given to patients in small test doses, dexamethasone inhibits ACTH release from the pituitary without contributing measurably to the total pool of glucocorticoids. Thus, under these conditions, dexamethasone does not interfere with plasma cortisol and urinary steroid measurements. This is a simple screening test only used to rule out Cushing’s. If depressed, the test is meaningful. Stress and obesity may invalidate the test, i.e. no suppression. One (or two) mg of dexamethasone is given orally to the patient at 11:00 p.m., and at 8:00 a.m. a blood specimen is obtained for serum cortisol measurement. False positives (nonsuppression) in psychiatric disease, stress, and induction of increased metabolism of dexamethasone in the liver by phenytoin (Dilantin); high cortisol values because of increased transcortin (pregnancy, contraception), and obesity; and of critically ill hospitalized patients, 25% will have a false positive result; false negatives are rare (< 1%). The purpose of this test is the same as the short (overnight) test, but there are fewer false positives with this test. However, there are more false negatives (suppression in true Cushing’s) with this test than with the short test above. This test is performed as a follow-up after a low-dose test has shown no suppression. Its purpose is to distinguish adrenal hyperplasia caused by tumors of the pituitary (basophilic adenomas) from autonomous cortisol-producing adrenal adenomas and carcinomas, and ectopic carcinomas (i.e., oat cell carcinoma of the lung). The test is also helpful in distinguishing Cushing’s disease from ectopic ACTH secretion; the ectopic tumor generally resists negative feedback. 24 hour urine collections are obtained daily for 4 days for free cortisol and 17-hydroxycorticosteroid determinations; Dexamethasone, 2.0 mg orally every six hours, is begun at 8 am on the second day and continued for eight doses; free cortisol and creatinine are measured in each twenty-four hour urine sample; other measurements include plasma cortisol at 8 a.m. and 8 p.m. on the first day to look for diurnal variation and at 8 a.m. on the fifth day. Patients with Cushing’s disease due to an ACTH-secreting pituitary adenoma usually show suppression of urinary free cortisol and 17-hydroxycorticosteroid excretion greater than or equal to 50% of baseline by the fourth day; lack of diurnal variation in plasma cortisol; and plasma cortisol ≤10 μg/dL at 8 a.m. on the fifth day. Urinary free cortisol not suppressed = either autonomous production of cortisol due to adrenocortical adenoma or carcinoma or autonomous ACTH production ectopically by certain types of carcinoma. Carcinomas of the adrenal cortex usually produce much larger amounts of steroids including androgens (testosterone) than do adenomas. Ectopic ACTH production sometimes can be demonstrated by selective venous blood sampling (via catheterization) from blood vessels draining tumor areas. The purpose of this test is to assess the ability of the adrenal cortex to respond to ACTH stimulation by production of glucocorticoids. The test is used mostly in the differentiation of primary hypocortisolism (due to adrenal failure, i.e. Addison’s disease) from secondary hypocortisolism due to hypopituitarism. ACTH is a polypeptide chain composed of 39 amino acids. The biological activity of the hormone resides in that portion of the molecule comprising amino acid residues 1-24 (identical in all species so far examined). For medical use a synthetic ACTH consisting only of these 24 amino acids has been prepared. It has full biological activity and lacks antigenicity. The preparation mostly used in the U.S. is Cortrosyn. A short and a long version of the test are in use. A blood specimen is first drawn to obtain a baseline cortisol and then 250 μg of Cortrosyn are given IV. Thirty and sixty minutes later, additional blood specimens are drawn for the stimulated cortisol levels. A normal response is a rise of at least 7 μg/dL after 30 minutes and a rise of 11 μg/dL after 60 minutes. If a normal response is obtained, nothing further needs to be done regarding assessment of adrenocortical function; the adrenal cortex has responded normally. If a subnormal response or no response is observed, the long stimulation test is indicated. In hypopituitarism of some duration the adrenal cortex is hypotrophic and needs stimulation over a longer period of time to respond. The test can be done on an outpatient basis. This test distinguishes primary from secondary hypocortisolism. Intravenous infusions of ACTH over 6 to 8 hours are given for 2 to 5 days. Urine free cortisol and serum cortisol are measured daily. Serum cortisol values that are over 20 μg/dL exclude primary adrenal insufficiency. Glucocorticoid withdrawal would be required before assessing secondary or tertiary adrenal insufficiency in such cases. 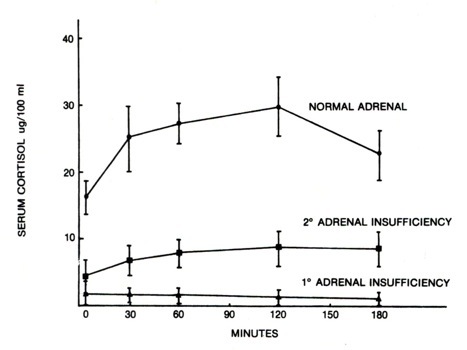 Little or no increases in cortisol secretion are seen in primary adrenal failure even over successive days. A progressive staircase rise is seen over 2 to 3 days in adrenal insufficiency caused by pituitary or hypothalamic disease or steroid level suppression. Little or no response is also seen in congenital adrenal hyperplasia due to 21- and 17-hydroxylase deficiencies. The CRH (corticotrophin releasing hormone) stimulation test may help to differentiate between Cushing’s disease and ectopic ACTH production. An intravenous bolus (100 μg) of CRH results in an increase in plasma cortisol levels in normal individuals and patients with tertiary adrenal insufficiency (hypothalamic). Most patients with Cushing’s disease show normal or, frequently, exaggerated ACTH and cortisol responses to synthetic CRH, whereas patients with ectopic ACTH-secreting or adrenocortical tumors show no response. Metyrapone selectively inhibits 11 β-hydroxylase in the adrenal cortex. This enzyme is involved in the conversion of 11-desoxycortisol (Compound S) to cortisol, the last step in the formation of cortisol. Thus, when metyrapone is given to a patient, cortisol production is inhibited. The negative feedback on the pituitary by cortisol is diminished, and the normal pituitary responds with an increase of ACTH release. The increased ACTH stimulates the adrenal cortex to produce adrenocortical hormones (except cortisol, whose synthesis is blocked) and to increase production of the precursors of cortisol (e.g., Compound S or 11-desoxycortisol) which appear in the circulating blood and in the urine, where they can be measured. In clinical practice metyrapone is used to test the ability of the pituitary to produce ACTH and to check the intactness of the pituitary-adrenal axis. The test differentiates only between normal and adrenal insufficiency. Since both a normal pituitary and a normal adrenal are required for a normal response, the test cannot differentiate between primary and secondary adrenal insufficiency. Furthermore, since metyrapone accentuates a pre-existing hypocortisolism, an acute crisis of adrenal insufficiency may be provoked by the test. For these reasons as well as the length of the test requiring hospitalization for several days, the metyrapone test is used infrequently. The 21-hydroxylase deficiency is by far the most frequent (> 90% of all cases) and for this reason it will be considered here. The terms adrenogenital syndrome and congenital adrenal hyperplasia should not be applied to all of the 6 listed deficiencies since anomalous sexual development and adrenal hyperplasia are seen only in some of these conditions. This test is used in the differential diagnosis of adrenogenital syndrome (congenital adrenal hyperplasia) to detect 21-hydroxylase deficiency. 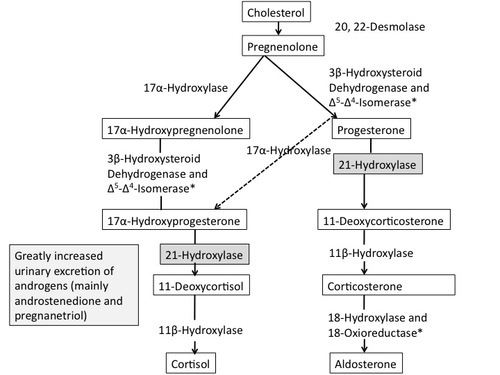 This enzyme converts 17-α-hydroxyprogesterone to 11-desoxycortisol in the pathway of cortisol biosynthesis in the adrenal. If the enzyme is absent, this biosynthetic step is blocked and 17-α-hydroxyprogesterone accumulates in high concentration in the blood (Figure 7). This condition may constitute a life-threatening medical emergency. The test can be done within a few hours (without having to resort to 24-hour urine collections) before steroid treatment is instituted. 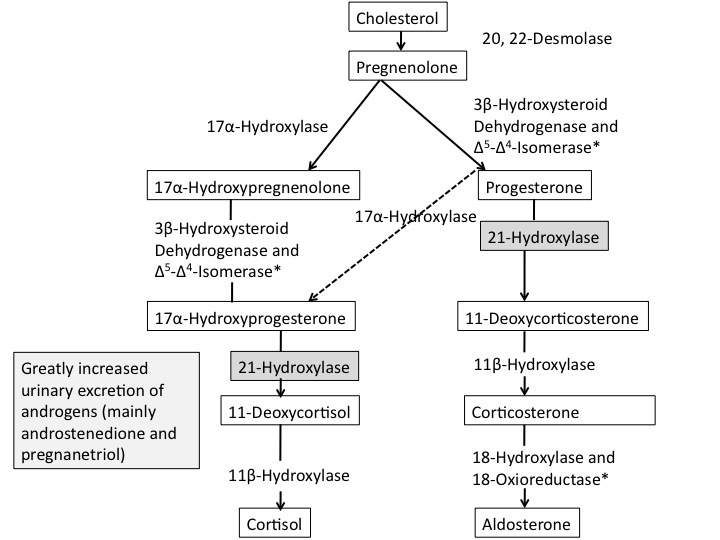 The pathways in the synthesis of cortisol and aldosterone from cholesterol, showing the sites of the enzymic block in congenital adrenal hyperplasia that are due to the 21-hydroxylase defect, and the principal steroids that are excreted in abnormal amounts in this disease. *Single enzymes that possess both the catalytic activities that the names describe. “Hypercortisolism” is now a generic term for elevated cortisol for any reason. 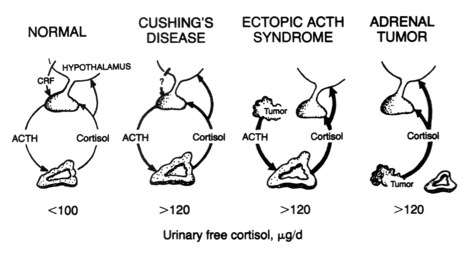 Pituitary-dependent ACTH hypersecretion (Cushing’s disease) is the most common (70%) cause of endogenous Cushing’s syndrome in adults, followed by ectopic ACTH syndrome (12%). ACTH-independent causes of Cushing’s syndrome include adrenal adenoma (10%) and carcinoma (8%). If Cushing’s syndrome is suspected on clinical grounds (obesity limited to trunk, moon face, buffalo hump, abdominal purple striae, muscular weakness, osteoporosis, hypertension, dys- and amenorrhea, mental disturbances, hirsutism, virilization, diabetes mellitus), the suspicion can be further confirmed by obtaining electrolytes, serum glucose, SUN and urinalysis. Electrolytes: excess cortisol may have a mineralocorticoid effect leading to sodium and water retention, and potassium and hydrogen ion loss. The resulting picture is: normal sodium, low potassium, low chloride and high bicarbonate (hypokalemic alkalosis). In cases of ectopic ACTH production this may be seen before the full picture of Cushing’s syndrome develops. Glucose: the glucocorticoid effect of excess cortisol causes gluconeogenesis and impaired glucose tolerance. Glucose is high in 2/3 of cases. Urea nitrogen: SUN is moderately elevated because of increased protein breakdown leading to muscle wasting, osteoporosis and negative nitrogen balance. Further confirmation of the clinical impression may be performed using Figure 8. Figure 8: Assessment of Cushing's Syndrome (Hypercortisolism). Click to enlarge. When hypocortisolism is suspected on clinical grounds (tiredness, weight loss, abdominal pain, nausea, hypotension, pigmentation of skin and buccal mucosa, mental disturbances) the suspicion can be further confirmed by obtaining serum electrolytes, glucose and SUN. 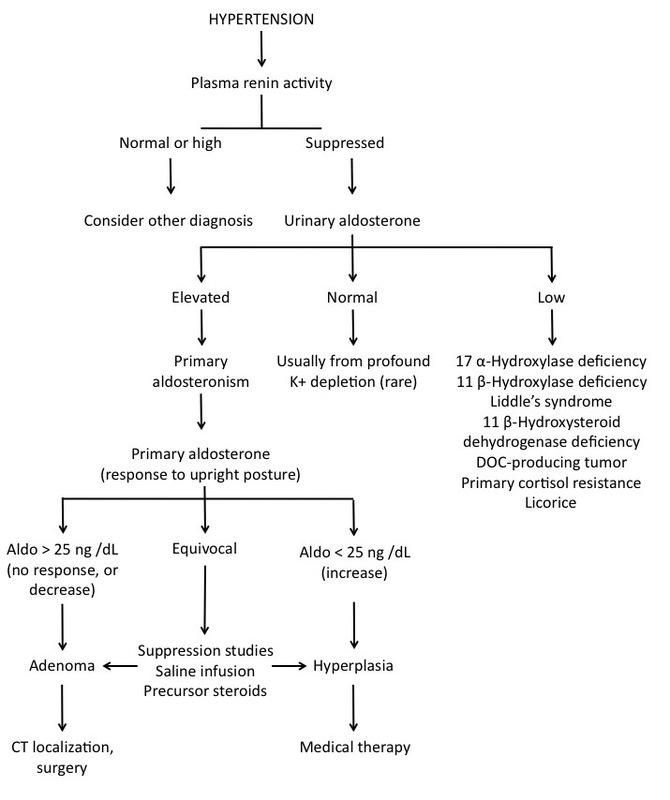 Electrolytes: in Addison’s disease, because of the lack of aldosterone, sodium is lost in the urine, and potassium and hydrogen ions are retained. The typical findings are that of hyperkalemic acidosis; sodium is low or normal (accompanying water loss), potassium is high, chloride is low, and bicarbonate is low. Glucose: glucose is low because of lack of glucocorticoid action, and there is increased insulin sensitivity. Urea nitrogen: urea nitrogen may be elevated because of hemoconcentration, volume depletion, and reduced glomerular filtration. For further confirmation, one should obtain plasma cortisol, morning value. If this value is high, hypocortisolism is excluded. If values are low or low normal, proceed as in Figure 9. Figure 9: Assessment of Adrenocortical Insufficiency (Hypercortisolism). Click to enlarge. A clinically severe and a milder form of this disease are observed. In the severe form there is marked sodium depletion since the 21-hydroxylase not only is involved in the biosynthesis of cortisol but also in that of aldosterone. Thus, these infants suffer from hypocortisolism and hypoaldosteronism with salt loss. Because the negative feedback control by cortisol on the pituitary is absent, ACTH production is unchecked and the precursors prior to the enzymatic block accumulate. These precursors lead to increased production of androgens that are the causes of the anomalous genital development, virilization (pseudohermaphroditism) in girls, and precocious puberty in boys. In the clinically severe form, correction of the electrolyte abnormality and steroid replacement should be initiated without delay. Serum electrolyte and cortisol measurements should be obtained immediately in order to manage the acute condition. Blood and urine samples should also be collected prior to or at the beginning of treatment. Serum 17-α-hydroxyprogesterone may be elevated more than 10-fold, which is virtually diagnostic. If successful replacement steroid therapy is instituted, ACTH production by the pituitary is inhibited, and the abnormally high levels of serum 17-α-hydroxyprogesterone and urinary steroids decrease. This can be used as a guide to successful treatment. In the milder form the major abnormality is hypocortisolism while sufficient aldosterone is produced to prevent salt loss. However, virilization is still seen because of the overproduction of androgens. In some patients the only biochemical abnormality is an elevated serum level of 17-α-hydroxyprogesterone which is the diagnostic feature of this condition. These patients may be capable of producing sufficient cortisol for normal maintenance but are unable to increase cortisol when under stress. Hypertension, hypokalemia, suppressed plasma renin activity and increased aldosterone characterized the syndrome of primary aldosteronism reported by Conn in 1955. The principal causes of primary aldosteronism (Conn’s syndrome) reported at that time were adrenal adenoma, bilateral hypertrophy of zona glomerulosa cells and, rarely, adrenal carcinoma. If hyperaldosteronism was suspected on clinical grounds (hypertension, muscle weakness, latent tetany and paraesthesiae, polydipsia, polyuria), further investigation began with obtaining serum electrolytes and urine potassium. Excess mineralocorticoids lead to sodium and water retention, and potassium and hydrogen ion loss. The resulting picture of hypertension, which includes a high-normal sodium, low potassium, low chloride and high bicarbonate (hypokalemic alkalosis), explained less than 1% of essential hypertensive patients. In addition, these patients usually had inappropriately high urinary potassium excretion (normal <30 mmol/24h when serum K+ <3.6 mmol/L). Further work by Conn in the 1970’s suggested that the prevalence of primary aldosteronism might be as high as 10 to 15%. Initially, this was not accepted; however, in the last few years this concept has been validated and the early phase of the disease is called “normokalemic primary aldosteronism” since patients are frequently normokalemic. It is now recognized that primary aldosteronism is most commonly caused by bilateral adrenal hyperplasia (72%) and adrenal adenoma (27%). It is now thought that patients with hypertension and hypokalemia, regardless of presumed cause, and patients with treatment-resistant hypertension should be screened for primary aldosteronism. Precautions: the serum and urinary potassium should be measured either before the patient starts treatment with hypotensive drugs or diuretics, or after the patient has been taken off such medications. In addition, one must be aware that primary aldosteronism may be mimicked by treatment with carbenoxolone and by ingestion of licorice (both have mineralocorticoid activity). For further confirmation, one should obtain: simultaneous measurement of plasma aldosterone and renin. This is an important test to distinguish between primary and secondary aldosteronism. In primary aldosteronism (Conn’s syndrome), plasma renin is reduced. In secondary aldosteronism (which is far more common than the primary form and is associated with conditions such as cirrhosis, nephrotic syndrome and congestive heart failure), renin is high and is the cause of the excessive aldosterone secretion. The best test is the ratio of aldosterone to renin. Patients on beta-blockers, angiotensin-converting enzyme inhibitors, angiotensin antagonists, and diuretics should stop these drugs at least 3 days before the study. The potassium-sparing diuretic spironolactone (an aldosterone inhibitor) should be stopped for 4 weeks before blood sampling. Blood samples are obtained from patients in the sitting position. Precautions: plasma aldosterone and renin are affected by posture and, therefore, basal blood measurements should be made with the patient recumbent. Bilateral adrenal venous sampling for measurement of aldosterone concentration remains the most accurate test in differentiating between an aldosterone-producing adenoma and bilateral adrenal hyperplasia, although it can be technically difficult to perform. If the patient has an adenoma, the aldosterone is higher in the adrenal vein draining this gland than in the inferior vena cava, and lower (suppressed) on the contralateral side. In contrast, the aldosterone is higher in both adrenal veins than in the inferior vena cava in patients with idiopathic adrenal hyperplasia. Single enzymes that possess both the catalytic activities that the names describe. Figure 11: Decision Diagram for Primary Mineralicorticoidism. Click to enlarge. Taken from: Greenspan FS, Baxter JD, Basic & Clinical Endocrinology, 4th Edition. Norwalk, CT: Appleton & Lange (1994). A 43-year-old woman has had fatigue, muscle weakness, facial puffiness, and easy bruising for 18 months. Physical examination reveals hypertension, round facies, muscle wasting, and numerous purpuric lesions. Plasma cortisol level (at 8:00 a.m.) is 32 μg/dL. Urinary cortisol excretion is 475 μg per day; it falls to 150 μg per day after administration of dexamethasone, 8 mg daily. Chest and skull x-rays show osteopenia, without other abnormality. What is the most likely cause (diagnosis) for these findings? What additional studies should be performed? A 26-year-old woman had a normal pregnancy, but her delivery is complicated by uterine atony with excessive bleeding and shock. Five days after delivery she develops anorexia, nausea, vomiting, and confusion. At this time her blood pressure is 80/40 mmHg. The physical examination is otherwise unremarkable. A 52-year-old man has had general malaise and muscle weakness for 6 months. During the last 3 months he developed bilateral gynecomastia. For 2 months he has complained of feeling “fullness” and dull pain in his right abdomen and has noticed some weight loss. Laboratory data are: urinary free cortisol 350 μg/day. Administration of 8 mg dexamethasone daily did not lead to a decrease in urinary free cortisol.